Christopher Paul "Chris" Colfer (born May 27, 1990) is an American actor and singer, known for his portrayal of Kurt Hummel on Glee, for which he has received several nominations and awards, including a Golden Globe in 2011. Colfer is openly gay and shared on Access Hollywood that his parents were accepting of him but he was frequently bullied at school. He originally auditioned for the role of Artie with the song "Mr. Cellophane" but Kevin McHale was selected for the role. However, the casting directors were so impressed by Colfer that they wrote the Kurt Hummel character into the show as a vehicle for him. Colfer commented on his casting, "It's good to have something positive, especially for kids in small towns, like myself, who need a little pick-me-up." 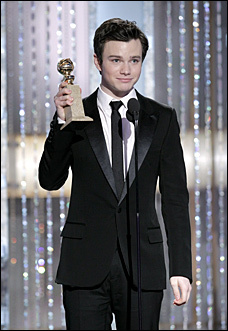 Kurt Hummel has gone on to become an audience favorite. Colfer's sister, Hannah, suffers from severe epilepsy, and often experiences over fifty seizures in an hour. Colfer has commented that when he was younger he used acting as a method of escaping the stress involved with having a family member with disabilities (Wikipedia). "Glee" star Chris Colfer on bullies: "It's embarrassing and it's uncalled for...it was heart-wrenching"
FILM: "Teach Your Children Well"